BROOKLYN, NY (September 10, 2012) - The Hon. 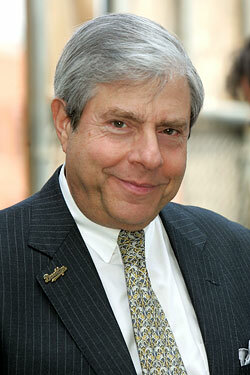 Marty Markowitz, Brooklyn Borough President, issued a Proclamation declaring September as 'Preparedness Month' in New York City's most populous borough, home to some 2.5 million residents. 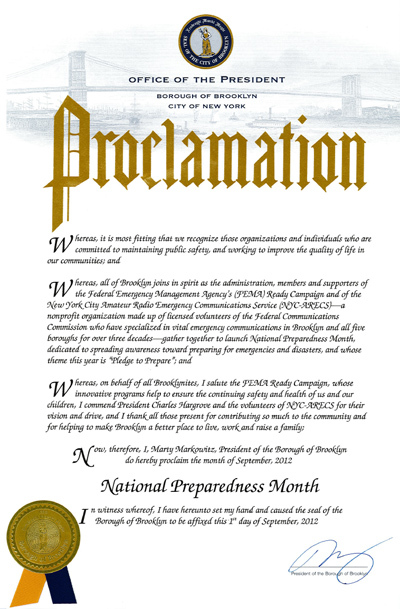 The proclamation was sought by the New York City Amateur Radio Emergency Communications Service (NYC-ARECS), an accomplished organization made up of New York City-based licensees of the Federal Communications Commission (FCC) who volunteer their time and specialize in emergency communications throughout Brooklyn and all of New York City. The Borough President said: "On behalf of all Brooklynites, I salute the FEMA Ready Campaign...and I commend President Charles Hargrove and the volunteers of NYC-ARECS for their vision and drive, and I thank all those present for contributing so much to the community..." As part of the Ready Campaign, with Brooklyn home to persons of many different countries, NYC-ARECS has distributed FEMA disaster preparedness literature in several different languages at their events. NYC-ARECS President Charles Hargrove encourages all New Yorkers to become more involved with preparing for emergencies in their communities. He said, "People can get trained and volunteer, we can always use additional radio operators, and people can also join a Community Emergency Response Team, the Medical Reserve Corps and the American Red Cross; there are many programs in New York City where people can lend a hand and prepare their communities for emergencies." NYC-ARECS is a Federal Emergency Management Agency (FEMA) National Preparedness Coalition partner, whose objective this September is to help prepare the public for emergencies and disasters of all types. The Coalition grew out of the tragic events of 9/11, an event in which NYC-ARECS members played a key role in assisting New York City during and after the attack. This year's Coalition campaign focuses on the theme: Pledge to Prepare. FEMA urges communities around the country to pledge to better prepare themselves for disasters. Information on ways to participate in Preparedness Month activities in Brooklyn and across New York City, can be found at FEMA's Ready Campaign website: ready.gov and on the website of the New York City Office of Emergency Management at nyc.gov/html/oem. Persons interested in learning more about NYC-ARECS should visit: nyc-arecs.org.